1. Bright - Tower Hill. (8km Return Trip) Drive 2km from Bright towards Porepunkah on the Great Alpine Road. A left turn takes you up a gravelled road to the lookout over Bright with Mt Bogong in the background. Return by same route. 2. Bright - Clearspot. (25km return trip, most on gravel roads) Drive up Baker Gully Rd and continue along signed forest roads through pine plantation to the top. Good views of Mt Buller to the south across to Mt Buller and the ranges. Return by same route. 3. Wandiligong Valley (60km return trip to end of sealed road) Take Wandiligong Rd south from Bright along Morses Creek. Picturesque valley which is classified by the National Trust. Once a gold mining town now with many preserved buildings, also apply orchards, nuts and various horticulture. 5. Bright - Lake Buffalo. ( 100km round trip, all sealed road) Drive down the Great Alpine Road to Myrtleford, then left into the Buffalo Valley Rd to the lake. 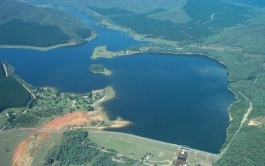 Fishing, boating, water skiing, designated swimming and picnic areas. 6. Bright - Buckland Valley ( 90 km round trip to end of sealed road) Drive along Great Alpine Road to Popepunkah round-a-bout then turn left down Buckland Valley Rd. Road passes through grazing land, tobacco farms and orchards at the foot of Mt Buffalo. Porepunkah airfield is situated along the route. The trip can be continued along gravel road where there are many access points to the river. Return along same route. 7. Bright - Mt Beauty - Alpine National Park ( 150km round trip - sealed roads to Falls Creek) Take the Great Alpine Road south from Bright for 6km, then turn left and follow the road past grazing land and walnut groves climbing to the Tawonga Gap. Good views here from the lookout. The road then drops into the Kiewa Valley, turn right to Tawonga south and Mt Beauty. ( check at the Tourist information Centre (Ph. 03 5757 3172) for details about the Kiewa Hydro Electric Scheme and information on visiting hours for the Hydro Electric Power station situated on the road up to Falls Creek ) Further on, past Mt Beauty (14km) is Bogong Village situated on Lake Guy, well worth a visit especially in autumn and spring. Continue on winding sealed roads to Falls Creek a major ski resort in winter and excellent bushwalking base in summer. The drive acros the Bogong High Plains from Falls Creek on gravel roads can include short walks to Wallace or Cope Huts or Mt Cope summit. Return by same route. 8. Bright - Mt Buffalo National Park (80km round trip, all but 6 km on sealed roads) Drive along Great Alpine Road to Porepunkah round-a-bout and follow across round-a-bout to Mt Buffalo Rd and the park entrance ( entrance fees apply ). The road winds up 23km to the plateau, with walks to Eurobin Falls and Rolleston Falls along the way. Once on the plateau you have the options of turning left to see the Mt Buffalo Chalet, Bent's Lookouts and go on the Gorge Nature Walk, or continuing on to Lake Catena, passed Dingo Dell and on to Tart Inn and then to the Horn Lookout. The road from Tatra Inn to The Horn is gravel and closed in winter. Return by the same route. 9. Bright - Harrietville - Mt Hotham - Alpine National Park. (120km - sealed road to Mt Hotham) Travel south along the Great Alpine Road to the historic gold mining town of Harrietville the road climbs up through tall native forests, and is sealed all the way to Mt Hotham Alpine Resort. Breathtaking views lookout over the alpine high country. Many and varied bushwalks can be stared from this area. If you wish the drive can be extended considerably by continuing on to Dinner Plain. Omeo and then the High Plains Road to Falls Creek and Mt Beauty, finishing the route to Bright over the Tawonga Gap. Much of this extension is on gravel roads that often vary in condition.